We have our own facilities to produce aquarium furniture. 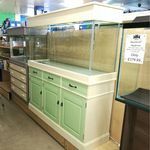 As well as providing new aquarium furniture we can also supply aquarium hoods and bases to suit any size aquarium that you may already own. As with all wooden aquarium furniture it is important that all condensation covers are kept closed at all times and any water split is wiped up immediately otherwise the wood will swell. Our delivery charges are based on most Uk destinations, we can not deliver to Highlands , Cornwall , Ireland or Central London plus a few other outlying areas at these costs, please enquire.